Our legacy is established through the close working relationship we have with IRATA International. Multiple team members are involved with the local Regional Advisory Committee and IRATA International Committees. Each and every employee of 5th Point has an individually tailored professional development plan, with an on-going focus towards training and education – not only in their vocational trade field, but within rope access as well. As an IRATA Training Member company, we ensure everyone goes through regular training, working closely with our IRATA Instructors and Assessors. This ongoing, hands on learning ensures that each personnel work well within a team, strives to excel on the job, and above all – puts health and safety first. 5th Point can supply Level 3 Rope Access Safety Supervisors, along with individually selected rope access technicians with applicable trades to work on projects. Each crew is backed by a close-nit operational project support team. We have an IRATA Auditor on the management team – ensuring compliance at every stage of the project. We focus on attaining excellence through effective communication on all projects, to ensure a seamless pathway is established. 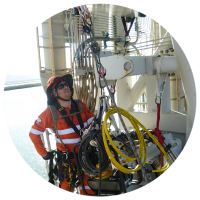 This allows for the timely completion of operational rope access projects, through the efficient use of the right personnel for the task at hand. All Project Leads, IRATA Level 3 Supervisors and additional Rope Access Technicians have the experience and trade skills applicable to the job – we don’t just supply a rope tech. 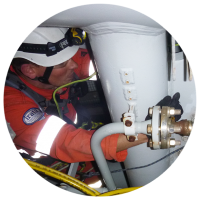 We supply personnel who have a core understanding of the project – for example, this means you get experienced Mechanical Fitters or Riggers who are IRATA Level 3 Supervisors. We bring the strict, audited IRATA Member Company systems – direct to your project. All personnel are inducted through all of our workplace documentation by team leaders, ensuring they have a comprehensive understanding of how and why this documentation is in place, how it controls the hazards associated with our work and the repercussions of what can happen if it isn’t followed. All operational projects are conducted in line with the IRATA International Code of Practice, with support from the IRATA Training, Assessment and Certification Scheme. 5th Point projects are managed by IRATA Level 3 technicians that also work as IRATA Instructors that like to use gear as efficiently as possible to allow for a better work flow and great attention to safety on the job. We use the exact gear that is needed to complete the job, instead of sending out a stock-standard kit. 5th Point trains over half of all IRATA International candidates in Australia and New Zealand. We train a lot of people. We keep an eye out for excellence, recruiting technicians who compliment the core values of 5th Point, have appropriate experience and relevant trade skill qualifications. 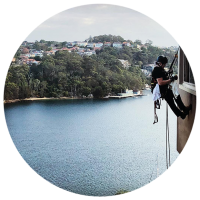 Our rope access project managers are able to be integrated into your organisational structure or project management team, depending on the needs of the project. 5th Point’s rope access project managers have significant industry experience, are proactive and motivated to complete projects to the highest standards, and offer the highest standards of rope access skills and experience. Many are also qualified as IRATA Instructors and Assessors. Our rope access project managers also have significant experience operating across varied client organisations and are experienced in managing projects within a wide range of policy and procedural requirements while maintaining focus on efficiency and delivery of a quality service to the end user. 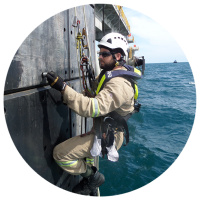 Our rope access project managers can also become involved in building and strengthening your client relationships, as well as in development of your capabilities and identification and relationship building with prospective clients. 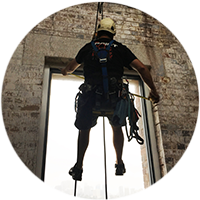 Our rope access site supervisors and other qualified rope access technicians are taken from a highly skilled pool of IRATA rope access technicians trained to the highest standards by us at 5th Point. All site supervisors are IRATA Level 3 technicians who bring their comprehensive knowledge of work techniques, rigging, IRATA International codes of practice and compliance to the project and site. They also have a complete understanding of complex rescue methods in conjunction with excellent communication skills. 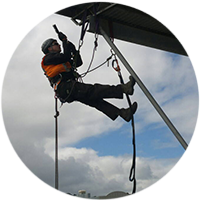 5th Point also has access to rope access technicians with trade qualifications and our team composition is sufficiently flexible to be adapted to the needs of each project. 5th Point is able to either deliver requisite trade skills within the rope access team, or facilitate your trade qualified personnel working in an environment requiring rope access. 5th Point recognise that supporting out rope access teams is vital to their onsite success. We are therefore committed to providing excellent rope access support and administrative assistance to all of our teams. There is very little our support and administration team are unable to handle! 5th Point also have the skills and experience to offer access to a rope access technical authority as required. This is a technical role with specific responsibilities in the framework constructed by IRATA International, that 5th Point can integrate within your organisation or offer as a 5th Point resource accessible for your requirements. It’s time to become leaders onsite – get in touch with us to find out more information.